No. You have to replace the LEDs. The only thing the blue vinyl is used for is if you want to do the Tick marks a different color than the numbers. They are illuminated by the same LED. So to get Blue ticks, and white numbers, you have to cover the ticks with the Vinyl. Yeah its an auto, deal with it. I have a FRS. Would it be possible to find a speedometer off a wrecked BRZ and swap with my speedo to get different LEDs? Everything should be good right? Technically yes (I don't know if anyone has done it yet though) but mileage is recorded on memory in the gauge cluster. So what type of led's does our dash use. And what is required to change the color of our speedo "stick" since it seems to be tinted red. I should be able to do this on Thursday since I have access to a soldering iron at school. All the answers are in this thread. 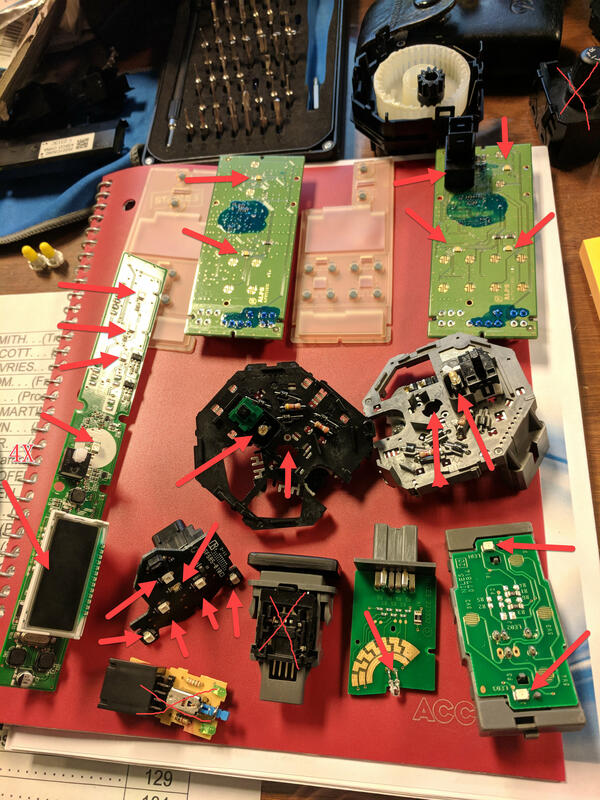 Can the next person that attempts this who has a working MPH/KPH toggle please take a high quality photo of the rear of the PCB (side the connector goes in) , preferably near the main connector please, need it for research! Your assistance will be muchly appreciated, only requires lifting the PCB out of the plastic frame once you have taken off the front white housing to get access to the LED's (just lifts right out). Don't remember reading it anywhere, but for those who do the LED swap on the Dual Climate Panel. 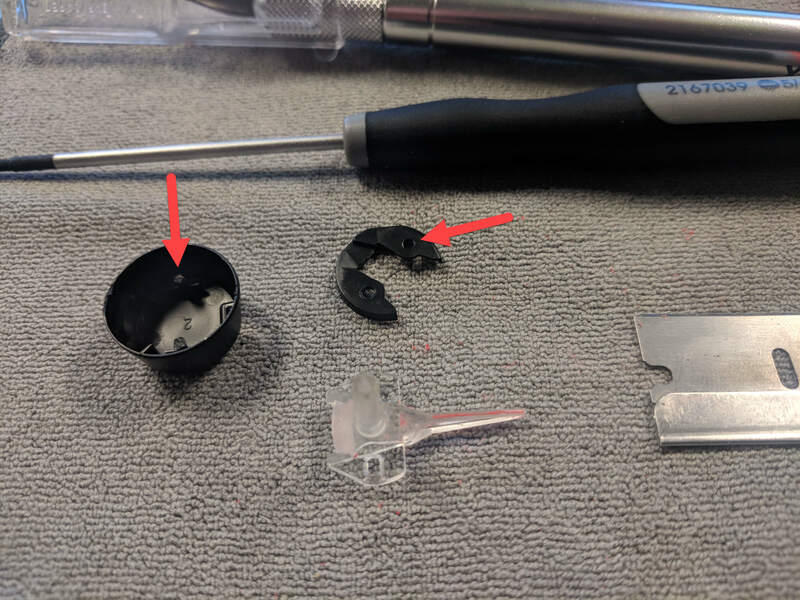 When you are taking it apart, there is a set of pins for the Screen on the top left (when looking from the back). They just pull straight up. Just go at it slow. Was fighting this last night as I took the new panel apart to clean and swap them. Didn't want to break anything. The Pins go into the set of holes at the top right of this picture. Anyone have the forward voltage and forward current values of the factory white cluster LEDs? I'm guessing around 3.0 volts and 0.02 amps. 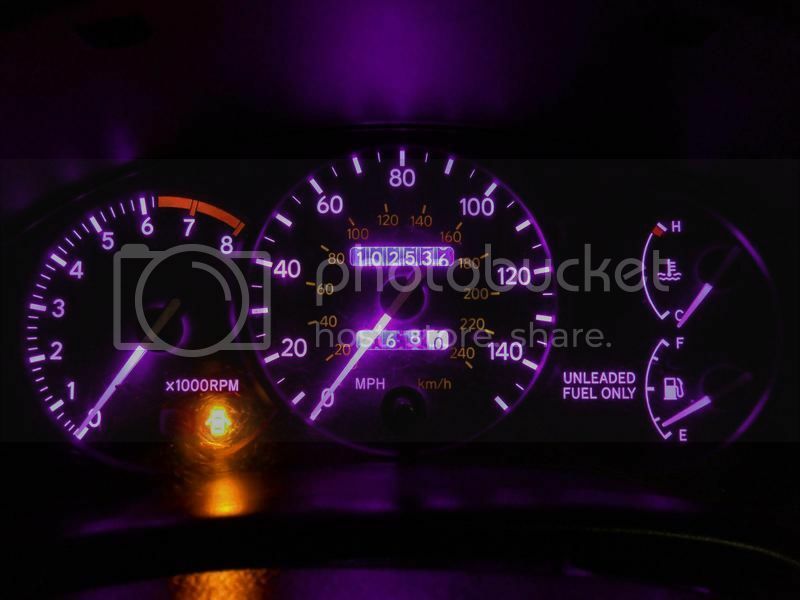 If I would do this mod I would go with ultra violet purple lighting. I've been in the process of completing this project. 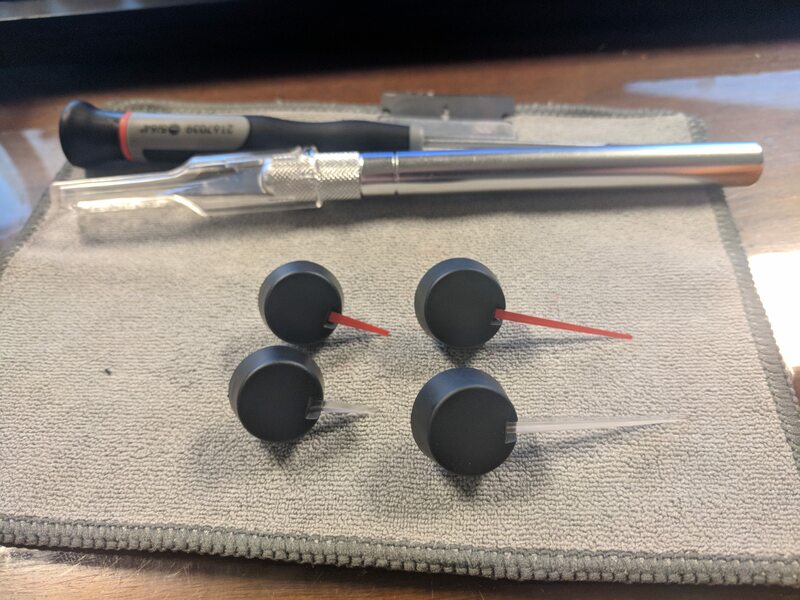 Figured i'd post if anyone was curious on how to separate the gauge needles from the black caps so you can clear them FULLY. I used a x-acto knife to cut the two black caps on the backside of the needle. I slowly wiggled the knife back and forth while giving it a little pressure. Go slow so you dont stab yourself or put the blade through the black plastic. Once the two caps are sliced off, you can take a fine flat head screw driver and pry up using the little notch. Once you have the plastic cap off, you can lightly pull the needle through the black cap. After scraping the paint off all the needles using a box-cuter style razor, just re-assemble as you took apart. Lastly i used a fine solder tip, to melt the plastic post to the back cover of the needle. You just have to touch the cap for a fraction of a second to get it to seal up, so be careful. And if anyone wanted to see what the door controls, hvac, lighting adjustment, and traction control led locations where at on a FRS, see the below picture. The x'd off items do not contain LEDs or may not be in your car due to an after market product. be sure to pick up more than the minimum as odds are you may mess up a couple during installation.